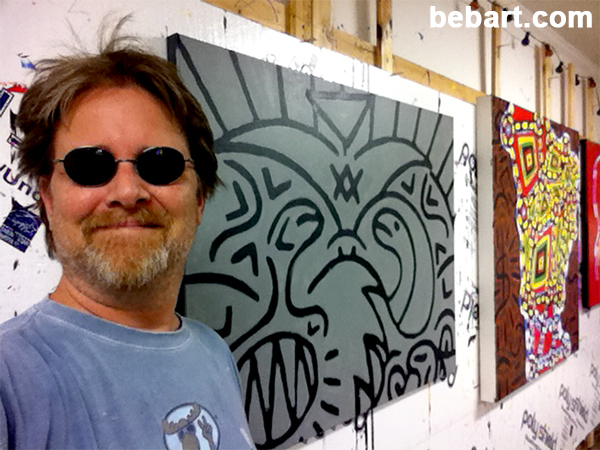 Burritt “Bucky” Benson’s art defies easy description. Even so, his paintings and drawings provide the viewer the opportunity to explore the blurry border between the organic and the inorganic, with the epics of childhood and songs of adulthood intermixed, accompanied by species both imagined and real. Through Bucky’s art the viewer can experience both the beautiful and the harrowing simultaneously, along with the constant cycles of growth and decay. Benson’s impulsive creativity process examines, synthesizes, and creates his nonverbal response to the complex experience of working in the moment, while hinting at a narrative, but remaining intentionally ambiguous most of the time. The Benson cosmos folds and unfolds for the viewer with unending and original creative force and bold inventiveness of intent sparking the imaginations of both the young and old alike. Burritt “Bucky” Benson III studied drawing throughout his childhood, high school and college. Knowing he was returning after college to work in the family construction company Bucky put his art ambitions aside and concentrated on a business degree, graduating in 1992, with a B.A. in Marketing from the University of North Carolina at Wilmington. A year later he married his college sweetheart Sara Shatterly. Bucky studied painting and digital arts in the Art Department at the University of North Carolina at Pembroke under professors Tarleton Blackwell and John Antoine Labadie. In 2011, his painting titled “Winning” was showcased at the “State of the Art/Art of the State” exhibition at Cameron Art Museum in Wilmington, North Carolina. 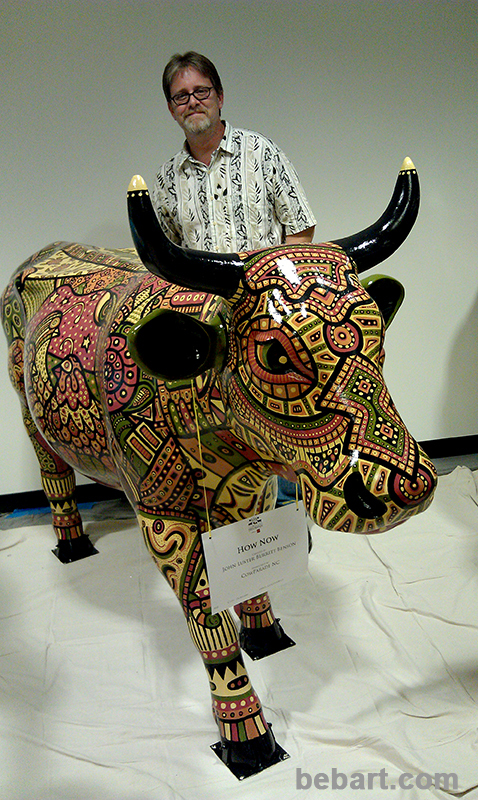 In 2012, Burritt contributed an original three dimensional painted work to the “North Carolina Cow Parade” which was then exhibited at the Ackland Art Museum at The University of North Carolina at Chapel Hill. Bucky’s “cow” art is now in the permanent collection of the North Carolina Zoo in Ashboro, North Carolina. Benson’s art has been the subject of international interest. In August of 2013, his paintings were featured in “The Lakeview International Journal of Literature & Arts, Vol. 1, No. 2.” In 2014, Bucky was commissioned to create original art for the NBC Sports Network Charlotte studio where Nascar America is produced. His original drawings and paintings have been in numerous exhibitions and arts publications and also reside in various private collections. University of North Carolina at Wilmington, Wilmington, N.C. Bachelor of Arts in Marketing, 1992. Fayetteville Tech Community College, Fayetteville, N.C.